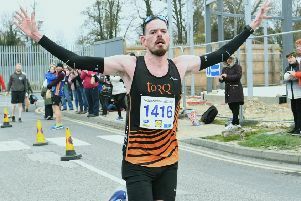 James Mogridge of Yaxley Runners upset the formbook, when recording his maiden race win at March on Sunday in the fourth leg of this season’s Frostbite League. Paul Vernon of PACTRAC has dominated the series over the past couple of years, but met his match on the muddy five-mile course as Mogridge ran an assured race to win by a comfortable margin. He crossed the line first in a time of 29:00, 18 seconds ahead of Vernon. Nene Valley Harriers ace Lloyd Kempston came home third just ahead of Werrington Jogger Paul Halford, who is getting back to his best after a spell in which he was struggling for motivation. Phil Martin of Bushfield Joggers and Eye’s Ben Heron finished sixth and seventh respectively, with Daniel Snipe in the colours of Ramsey ninth and Nene Valley youngster Jevan Roberton 10th. Eye runner Sarah Overington followed up her fine 13th place finish in the Cambridgeshire Cross-Country Championship the previous weekend by coming home as third lady at March behind Clare Somerton of Cambridge and Coleridge and the consistent Lisa Marriott of Ramsey. The Frostbite League was won by Nene Valley last year, but looks to be heading out of the area as the Harriers finished down in eighth position, in part due to a clash with the Lincolnshire Cross-Country Championship. Yaxley were the best placed Peterborough team finishing in fourth spot in a fixture won by St Neots club Riverside Runners. Werrington Joggers lie third overall behind Hunts AC and Riverside Runners. Nene Valley Harriers are fifth, and it looks unlikely that either club will challenge for the title this year with just two races left. Issac Ellard of Eye was the first local home in the junior race finishing third, while his team-mate Ella Robinson was first girl. The winner was Hoey Croft of Hunts AC. Nene Valley were the top local club finishing fourth on the day. They also occupy fourth position in the series standings.